This is a little bit of info you may want to know about me. I’m a graduate of The University of Alabama where I received my degree in Non-Profit Management and Event Planning. After graduating in 2012, I began taking classes online and recently became a certified Interior Designer from the Interior Design Institute located in California. I am a wife, daughter, granddaughter, sister, and friend to some of the most amazing people on earth. The Lord truly blessed me with the finest mentors, side-kicks, and supporters I could have ever asked for. There are so many things that I love about life, including: My relationship with Jesus Christ, time spent with my amazing family & friends, traveling, the South, thrift store shopping, yard sales, bangle bracelets, big-teased hair, painted fingernails, date nights, new shoes & purses, clearance racks, Blue Bell ice cream, weekends, tan skin, everything about the Autumn season, Alabama football, anything that sparkles, and last, but not least…painting, creating and designing STUFF! Creating unique artwork and designing beautiful spaces is my passion in life. Ever since I was a small child I have always been aware of design and color. As a little girl my family would drive around and look at all the different house designs, whether we were in our surrounding neighborhoods or on vacation. If there was ever an open house, we were always the first ones in to check out the interior design of the remodeled home. Scanning through magazines and tearing out the “good pages” have been a hobby of mine ever since I learned to read. Growing up with creatively inspired parents and grandparents molded my life in a fundamental way. My mom taught me to use a sewing machine before I learned to tie my shoes, while my dad educated me on all the carpentry tools. From the time I began earning allowance as a child, shopping for craft supplies and wood working materials was a weekly quest. Whether it was paint materials, colored pencils, marker sets, sketch paper, crochet needles, tool kits, or a wood burner, I always seemed to find the money and time for craft projects. After many years later… I am still buying craft materials, making unique items out of “junk”, designing artwork, building items with power tools, doodling with markers, and re-vamping spaces. Spreading my love for stunning design and happy artwork is my mission! I can’t imagine going through life without creating something beautiful! Emily’s Original Art came to be in June of 2009. I decided to take the summer off from college and open my very own art shop in Mentone, Alabama. I found a tiny building on the main street for rent and jumped on the opportunity. For anyone who know me, it’s no surprise that I spent “every waking moment” at my little shop. It was literally me pride and joy. I would open my doors early in the mornings and “close shop” late at night. With Nora Jones playing on the CD player and delicious smelling candles burning inside the shop, it became my “home away from home”. 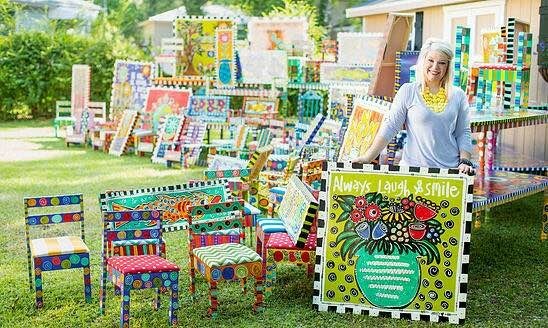 I would set-up my “paint studio” outside, underneath a big oak tree, while customers strolled through my tiny shop filled with various pieces of artwork and furniture for sale. In those short months, I met hundreds of new faces, many of who are still great friends today; I learned how to run my own business; and most of all I learned who I truly was. I was a girl who was determined, outgoing, creative, and not afraid of taking chances! Since 2009, my client base has grown to include for-profit businesses, non-profit organizations, schools, and private households all over the world. In 2013, my first line of artwork with Magnolia Lane Collections was featured at Atlanta & Dallas Markets. My original artwork and home décor designed for Magnolia Lane Collections can be found/ordered for wholesale at http://magnolialanecollection.com. Every year I donate artwork to non-profit organizations and mission-based charities around the country, which includes my own mission charity called “Art on a Mission”. Emily’s Original Art allows me to use my creative talents, design concepts, marketing skills, and business expertise. My artwork has been featured in Louisville Magazine (April 2011), Shop 280 magazine, and Shop Tuscaloosa magazine. I also was asked to speak about Emily’s Original Art on ABC 33/40 “Talk of Alabama” in October 2012. “Be so happy that when others look at you they become happy too”.